The Born-Free 6 madness is finally behind us. Garages are getting re-organized, tools are being put away, e-mails are being answered, and it’s now time to reflect on this past weekend. Everyone experiences an event differently, so it’s hard to give an objective account of the whole weekend. I figured the only way to do Born-Free six justice was to allow some of our contributors to each submit their take on the event. You will see many Born-Free features in the weeks to come, but we’ll start with my take on the event. As the main sponsor for Born-Free 6, it’s ChopCult’s job to share and promote all things Born-Free. This cross promotion was generated through our grass roots program of rotating ads on our site and promotion through our social media outlets. Born-Free receives months of extra promotion as it’s our most significant event for the website and our community. Working together has allowed ChopCult to capitalize on the event as well. For the past two years, Mike Davis and Grant Peterson have made sure we have logo placement on their promotional items and a prime vendor spot. 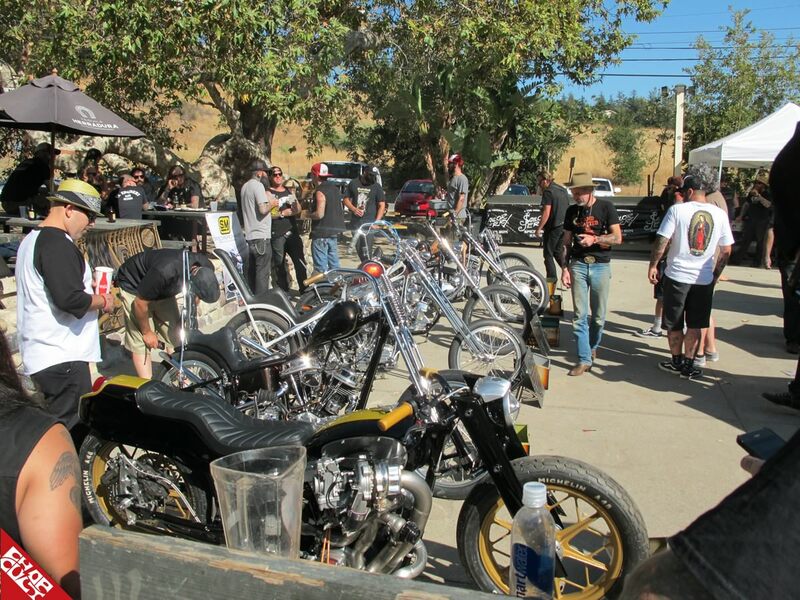 Having Lowbrow Customs, Biltwell Inc., Noise Cycles, At the Risers, The Speed Merchants, Chopper Dave, Loser Machine and Cycle Zombies as our neighbors made the weekend extra enjoyable. Show Class Magazine’s People’s Champ 2 at Cook’s Corner set the tone for the whole weekend. Bikes from near and far wrapped around Cook’s and went down the street as far as the eye could see. Duane and I were fortunate enough to ride down early and park our bike in the shade. The industry’s finest rubbed elbows and helped crown Mike Nielsen (@themightyawful), and his beautiful panhead, The People’s Champ. Big thanks to Tim Lind for allowing ChopCult to have a small role in his event. It’s been awesome to watch the People’s Champ gain momentum over the past two years. During the night, I met fellow ChopCult contributors Jason Ochoa and Mikey Arnold in person. Jason traveled with some friends and hand-delivered Scott Hoepker’s tank for the Art and Fuel exhibit. Mikey rode out and is documenting his roundtrip for an upcoming book that I promise won’t disappoint. Bear was also on location for the third year promoting his California or Bust Run. This year he was also riding for The Wounded Warriors Project and the Aidan Jack Seeger Foundation. They have all taken the role of contributor to heart and are each coming into their own in the industry, as it should be! Most “editors” get to arrive at an event with their booth set up and employees running the booth. This dream is not my world nor do I want it to be. My world consists of my husband Duane, my son Wayne, and me loading the bike, truck and booth wares. I then work the booth all weekend and break it down with Duane’s help. This is my world, and I wouldn’t change a damn thing. The past weekend was full of handshakes, obtaining future content, and meeting fellow members and followers. I even met a few folks who we helped by using the #chopcultaaa hashtag on Instagram. To hear accolades for the site and my work was humbling. The best gift for me at Born-Free is the limited cell phone service. Seriously, no one’s staring at their screens, and they’re enjoying the show and each other. It also allows me to spend time with the folks in front of the booth vs. trying to cover the show through my phone. I made sure to take the time to meet our advertisers; So-Cal Swapmeet, Clutch Monkey, Choppahead, Rolling Heavy Magazine, Street Chopper, Burly Brand, EMD and S&S Cycle. I can only say “thank you” so many times before it becomes redundant, but please understand that we do appreciate every advertiser. Their ongoing support keeps this little site rolling. Another highlight for me had Mr. Willie G from Harley-Davidson visit our booth, thanks to Michael Lowney. Michael has been a HUGE supporter of the site and is an all-around great guy. ChopCult was the first online community that Harley-Davidson embraced, and it will never be forgotten. The Invited Builder section with the one-off customs was mind-blowing. Everyone seemed drawn to Invited Builder Larry Pierce's final build, "The Larry Special." Larry’s longtime girlfriend Ashley Hardin graciously accepted the Loser Machine’s People Choice award on Sunday. Every invited builder seemed to forget about the awards and surrounded Ashley with love. To witness our community to pull together and stand as one was a beautiful thing! I need to give big props to Zack Boxx from Throttle Addiction for creating the Art and Fuel Exhibit. This exhibit was his brainchild, and it was a home run! 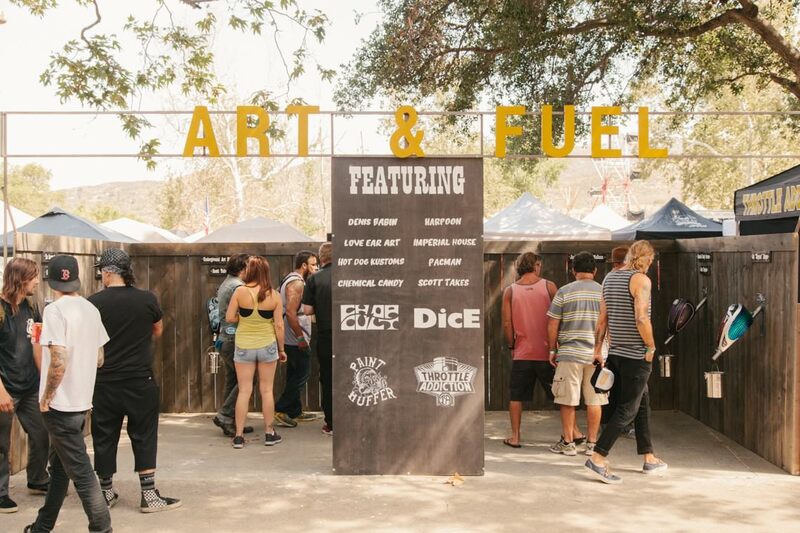 Bringing fellow artist Gen Katsuragawa, Denis Babin, Jack “Pacman” McCann, John “Harpoon” Harpov, Scott Takes, Pete “Hot Dog” Finlan, Scott Hoepker and ChopCult member Shawn Long together, created a beautiful space like no other. Each painter went above and beyond our expectations and delivered the goods. Photographer Elvis Castillo photographed the exhibit, and we will showcase it here soon. One would only hope the Born-Free alumni enjoyed the exhibit as much as we did and will welcome it next year. Here are some of my pictures from the weekend. Please keep in mind that Jason and Mikey will be showcasing the bikes in the crowd. I would like to thank Mike, Grant and their amazing team for another great event. Extending Born-Free to two days was one of the best decisions made. I don't know the final attendance numbers, but I'm sure they exceeded their goal. It was inspiring to meet people from all over the US, Japan, England, Malaysia, Hawaii, France, and Puerto Rico. Special thanks to Pete"Hot Dog" Finlan for painting the Biltwell giveaway helmet and to David Roy from VooDoo Vintage for donating a custom hardtail. I would also like to thank you for visiting our booth, supporting the site and our social media outlets. I understand the value of ChopCult’s association with events like The People’s Champ, Born-Free and Art and Fuel. It’s not to gain social media fame; it’s to secure longevity for the website and attract new members. I spoke to MANY people who said they use ChopCult daily but haven’t become an active member. My question would be “why not?” ChopCult is and will always be a community of like-minded motorcycle enthusiasts. I’m not just the Editor; I’ve been a member since July 23, 2009. Until we meet again, safe travels and enjoy the ride! -Day one motorcycle giveaway winner: Patrick Tracey chose a 1957 Triumph Pre-Unit Trike built by Ryan Mullion of the Tiger Shack. For Born-Free 7 updates, please visit www.bornfreeshow.com. Awesome recap! Wish I could have made it this year! Born free always a blast !!! It can't be easy watching over this growing family. Thank you for being the big sister to the chopper community! that HD scrambler look sick fun!, the old pans and the D. Mann paintsa re awesome, what a great event! Lisa, thank for all the effort and to your family...from Santiago of Chili, the growing family of Chop Culters thank you! Thank you Lisa. Awesome weekend! Thank you Lisa for the coverage of my art. You guy's are doing such a great job. Hope you and Duane have a great 4th! Great write up! I have to get there next year. Limited cell service. Love it! This write up is perfection! It was great meeting you and Duane in person and I am looking forward to seeing you next year if not sooner. excellent review Lisa! Thanks again for all the support!